U.S. Secretary of State John Kerry and Russian Foreign Minister Sergei Lavrov during a joint press conference following their meeting with Russian President Vladimir Putin at the Kremlin in Moscow, March 24, 2016. According to Russian observers, U.S. Secretary of State John Kerry's recent visit to Moscow was different from the previous ones in its atmosphere, which was notable for the absence of the tension that has characterized relations between Moscow and Washington in the last two years. Russian observers have hailed the relaxed atmosphere surrounding U.S. Secretary of State John Kerry’s visit to Moscow for top-level talks on March 23-24 as a sign that the tense relations between the United States and Russia may be thawing. Besides multi-hour talks with Russian Foreign Minister Sergei Lavrov and President Vladimir Putin, Kerry met with German Foreign Minister Frank-Walter Steinmeier and Crown Prince of Abu Dhabi Mohammed bin Zayed bin Sultan Al-Nahyan during two days of intense diplomatic activity. The fact of these meetings being held in Moscow alone contradicts the statements about the necessity of isolating Russia that the West made earlier against the backdrop of the Ukrainian crisis. The way the talks between Kerry, Lavrov and Putin were held also bears witness to the fact that the trend toward isolating Russia is receding into the past. According to the Russian media, the visit took place in a friendly atmosphere, one that everyone had already forgotten. 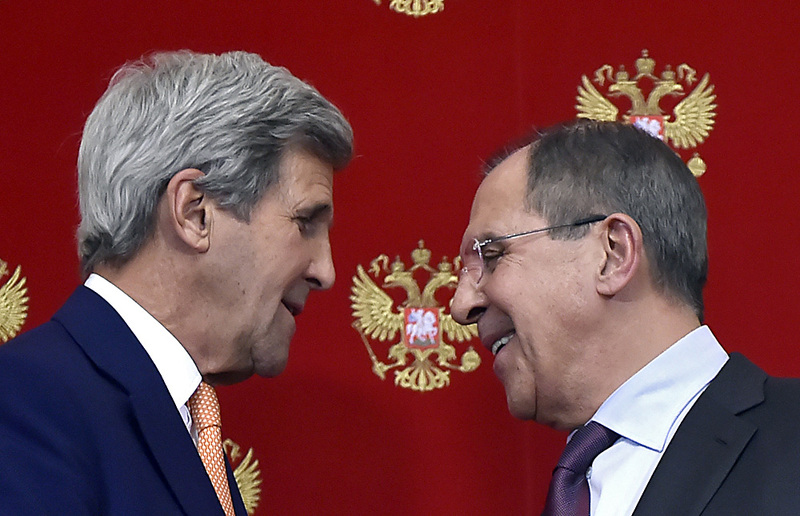 "John Kerry and Sergei Lavrov moved from reciprocal accusations to dialogue,” wrote the Kommersant business daily. “The relaxed atmosphere, which has not been seen in Russian-American talks for a long time, bore witness to a change of accent," wrote Kommersant about Kerry's visit, which, in the newspaper's opinion, sets the course for a limited partnership between Russia and the U.S. However, despite the politicians' relaxed form of communication, it was obvious that the talks were not simple: Kerry's meeting with Lavrov lasted for four hours, while his meeting with Putin was just as long. The talks concerned mainly the twin issues of Syria and Ukraine, on which Moscow and Washington have struggled to find common ground, especially regarding the two-year-old conflict between government forces and Russian-backed rebels in eastern Ukraine. Yet Russian observers say that the talks in Moscow demonstrate that the two countries’ positions on these issues are not as far apart as before. "Concerning Syria, we can say with 100-percent certainty that Moscow and Washington's positions are getting closer," said Yury Rogulyev, director of the Franklin Roosevelt Center for U.S. Studies at Moscow State University. At the press conference after the talks in the Kremlin, Kerry said that he was "pleasantly surprised" that the truce in Syria was possible at all and has been respected for almost a month. In Rogulyev's view, this shows that both sides are interested in continuing to search for solutions to Syria. Kerry stated in Moscow that the process of the political transference of power, the establishment of a temporary government and the creation of a new constitution must finish by August this year. In Kerry's words, both Moscow and Washington are trying to convince Syrian President Bashar al-Assad to make "the right decision" and join the talks about the creation of a transitional government. Russian commentators do not believe that the issue of Assad, whose resignation the West had been categorically insisting on until recently and who is supported by Moscow, is irresolvable. Yet Moscow and Washington have different ideas on how the issue should be resolved. In the opinion of Sergei Oznobishchev, director of the independent Institute of Strategic Evaluations, Assad is obviously important to Moscow as a stabilizing element in Syria. However, said Oznobishchev, if the process of creating a transitional government is realized successfully, Russia can guarantee the Syrian leader an "honorable departure." At the same time, Yury Rogulyev notes that in the last months, including in the period of the truce, Assad's position in Syria has significantly strengthened, meaning the U.S. will have to take the Syrian president into consideration. In such a case his departure is in no way a given. In relation to Ukraine, Kerry reiterated that U.S. President Barack Obama is willing to lift the sanctions against Russia only if the Minsk Agreements – the road map to peace in eastern Ukraine agreed on by the Russian, German, French and Ukrainian leaders – are implemented. Experts stress that what is important here is that Moscow and Washington, despite the ongoing hostilities in the Donbass, have confirmed that there is no alternative to the Minsk process. According to Sergei Oznobischev, Kerry's visit demonstrates Moscow and Washington's mutual desire to improve relations, which Russia hopes to see brought to a new level and in the future developed on the basis of genuine equality. The Kremlin, said Oznobischev, believes that until recently this equality did not exist. For example, the West did not take Russia into consideration when it supported the overthrow of President Viktor Yanukovych in Ukraine in early 2014. "Now we see how America and Europe are beginning to understand Russia," he said.